Are Crop Circles are Real? The crop circle phenomenon is real according to Dr Horace Drew, a scientist, who holds a PhD in Chemistry from Caltech, the California Institute of Technology, and worked for CSIRO as a molecular biologist, has been researching crop circles and aliens for 20 years. Dr Drew said he was one of a handful of scientists around the world who had worked to successfully decode some of the messages in crop circles. According to him, some crop circles provide general descriptions of the future. “Other crop (circles) show schematic images of the future for astronomical or human events,” he said. He said some of the decoded messages read: ‘Much pain but still time. Believe. There is good out there’; ‘Beware the bearers of false gifts and their broken promises’; ‘We oppose deception. Conduit closing’. Dr Drew has developed at least two theories as to the purpose of the circles by reading their “advanced (version of) binary codes”. “One theory is that they are trying to introduce themselves to us peacefully, like we do using bubble communication techniques with dolphins,” he said. His second theory was that the messages “are not even for us”. Dr Drew said human time travellers from the distant future could be creating the circles as directional markers, to help them navigate “in their distant past, which is our present”. I saw a documentary once showing how they are quite easily made by people. I did to, and it looked really sloppy afterwards not like some of the ones I've seen pictures of. Seems like it would take a long time for people to create one of the more elaborate ones, not sure how that could be done in a single day or night at least not without a lot of people. How do that many people sneak onto a crop field create an elaborate crop circle design and sneak away without ever being noticed? as far as I know the documentary didn't address that, just showed people could make a crude and small crop circle fairly easily. years ago in Western New York. Plenty of other curiosity seekers came, too. It turned out to be a hoax. It's just some stray cows rolling around in the corn. I am sick, and in so being I am the healthy one. Future time travelers would just grab a local newspaper out of a trash bin. "This Wall Street Journal is dated June 1st 1953, so we overshot. We need to make a U turn to get to March 1, 2017". Undoubtedly most crop circles are man made. Folks were hoaxing crop circles before they were even recognized as a thing. But that doesnt mean that there might not be a few crop circles that are.....not man made! One well executed crop circle was emblazoned with the message "we are not alone". Real aliens who had somehow learned to speak English would have emblazoned it with "you are not alone". So that one was probably of strictly amateur Earthling creation. Last edited by naturalplastic on 12 Mar 2017, 7:09 am, edited 1 time in total. 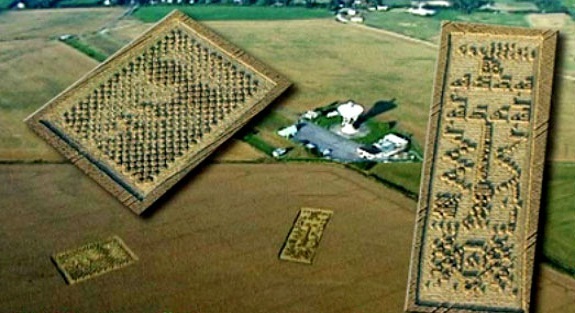 But that doesnt mean that they are there might not be a few crop circles that are.....not man made! Expecting aliens to have perfect English is like expecting the Japanese to have great English. If they are able to cross five hundred light years of interstellar space. And are willing to do that, plus make graffitti in a crop field just for our benifit, you would think that they would be able to get it straight which is which:first person plural, and second person plural! Crop Circles are real. They are made by humans with a snarky sense of humor. UFO addicts love to think these circles are made by Aliens, but they are not. There is not one piece of solid evidence that the Earth was every visited by Aliens from another star system. Socrates' Last Words: I drank what!! !????? Yup. The culprits of this reply to the Arecibo Message are the ones who work at the facility just right of center. BTW, the pixallated picture of the 'Alien' in the Second one looks a bit like either Gary Numan, or Ian Curtis of Joy Division with a Plastic Surgery Disaster Nosejob. So... How 'bout that California vegetable crop next year?